Since I began blogging in January, I have always loved sharing things about music and peace so when I discovered Kozo Hattori’s Blogger for Peace, I was rapt! This month though, I am sort of struggling with this challenge. I wanted to do something really special but when I try to sit down to write a song about Peace, a lot of things and songs come to my mind. Mostly it’s all the liturgical songs that I have grown up with. I guess this would be the best place to start because if it wasn’t for the music that I heard growing up in church, I don’t think I would be as formed as I am. Not everyone though believes in God but they do believe in peace and love so I thought why not put up a really lovely song that everyone should be able to relate to and with. Kozo Hattori in one way I think has started his own sort of Peace Train of sorts through our blogs so I thought it fitting to put up this video in my blog. Surely if we all stepped aboard the peace train in one way or another we’d start a really lovely revolution or evolution to peace. Thank you Kozo for setting out such a really wonderful challenge and I hope that everyone will glide on the peace train to make their country as well as our world a better place. Everybody has a certain something that they like to do in the morning. As for me, I don’t really appreciate being woken up by a whining dog but it’s something that I am used to. I can easily go back to sleep. Poor Adam doesn’t have that sort of ability. He will lie in bed with me until he gets uncomfortable but always tries to get out quietly as not to disturb me. I love that about him. He’s such a sweety. If I try to attempt the same strategy, I epically fail 9 out 10 times. The man sleeps lightly. For once, I am not exaggerating. After getting up, I usually head to the kitchen for breakfast. This morning, I had to grind more coffee for my coffee machine because I only had beans that needed to be ground. I like to have music on so I popped Pandora radio on my iPhone which I put into Adam’s high jacked iPhone speaker because good music needs to be blasted. I danced around the house getting ready to eat. We had to put on our sweats because it was a cool 11 c (51.8 F) in the house. Summer has fled our part the world until probably December. I danced as the coffee grinder ground my delicious smelling coffee which was grown in Mullaway. There is a coffee plantation somewhere in our vicinity. I am so glad we learned of it. I put out our cereal and danced while waiting for Adam to join me at the dining table. 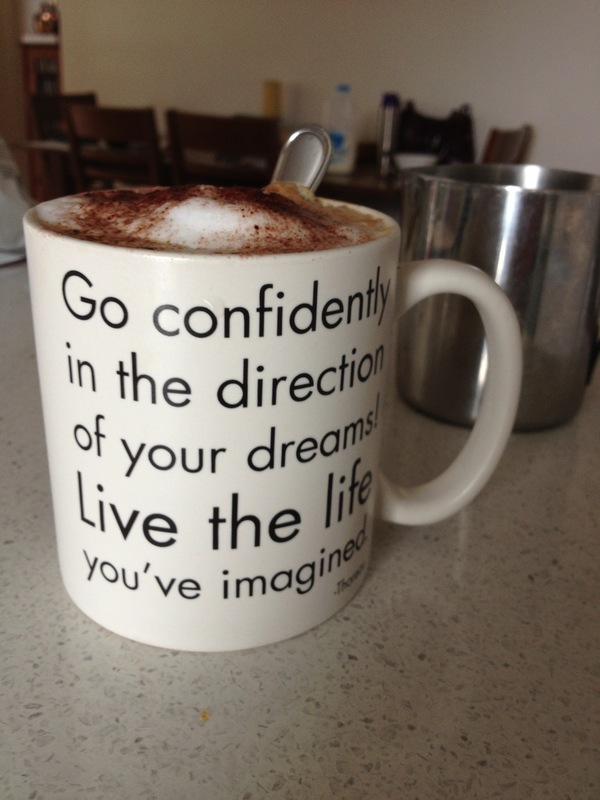 Sometimes I make my coffee after brekky as I did today. Adam went to go have his shower and I drink my coffee while deciding what I want to do next. The thing to do today was sit down and type out this blog. It feels like today is going to be a ripper of a day. I know my mom used to say not to sing before breakfast. I have, so let’s hope I prove that old wives’ tale wrong. I don’t want to cry before supper. I need to go shower now myself but I really love my morning rituals. My mornings are normally spent waking up listening to Mitch whine at me to be let off so he can go have a pee around 6. I then hop back into to bed for a cuddle with Adam or chit-chat then fall back to sleep but hunger always gets me up. We then go to the kitchen and break our fast with cereal. The dogs then get fed by Adam or myself (usually Adam) and I work on doing my cappuccino in a mug. (Muggaccino) There is normally music playing via the iPhone. I know it’s not that earth shattering or exciting but there is something about it that I like doing. Some people like to start their day with a run or walk but me, a cup of frothy coffee and cuddles always get my day off to the right start! Do you have any morning rituals that you love? 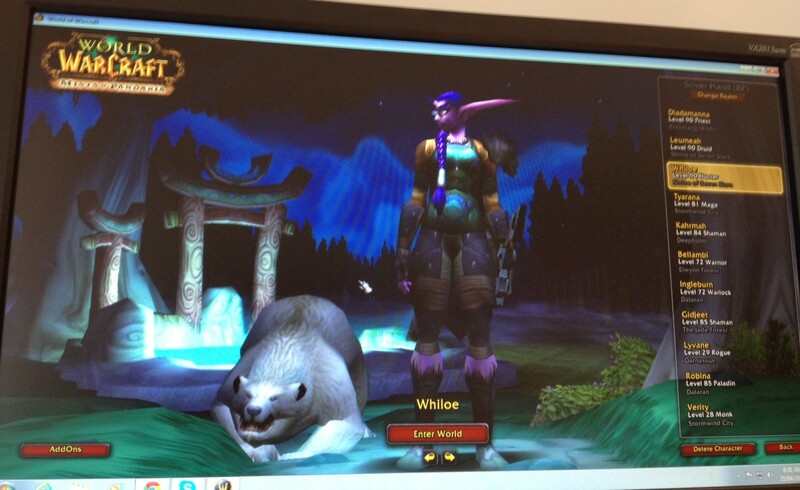 Some Australians already know of Barnsey who is a legend vocalist of the band Cold Chisel but did you know that I have created his alter-ego on the MMRPG of World of Warcraft? Actually, one of my toons (characters) lovingly named her bear after Jimmy Barnes because he too loves cheap wine and 3 day growth. 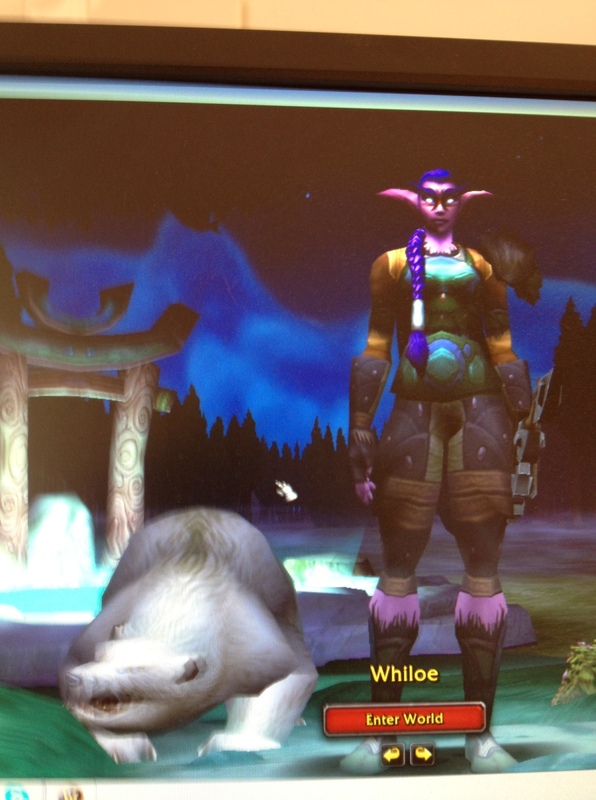 The character, Whiloe, who is a night elf huntress on the realm(server) of Silver Hand can tame many animals but the one she holds dearest to her heart is Barnsey. She did have a Barney but she decided to give him up when she discovered Barnsey near Everlook. Whiloe with Barnsey about to enter the world! Better look at Whiloe, Barnsey is shaking his head so you don’t get a clear look at him. His excuse is all the cheap wine making his vision blurry. I had never heard of Jimmy Barnes or the band Cold Chisel until I moved from the land of my birth. I do enjoy their music though. It’s considered to be pub rock. I never heard that term until I came to Australia but now I get it totally. They have been around quite a while, something like over 20 years. Jimmy Barnes and Ian Moss are headlining a tour soon in my area. I should have bought tickets. Sorry about my digressing from the subject of Barnsey but I thought I would let you into my thoughts about my Barnsey and his love of Cheap Wine! Ian Moss shouldn’t feel left out. I have a Draenei huntress named Neches who tamed a ravager called Mossy in the realm of Lightbringer. I do love writing fun random posts so I thought this could be a cool subject to do! I leave you with the song that inspired Whiloe with the naming of her Barnsey. When I moved to Australia back in 2002, I had no idea who Paul Mac was. I am hoping with this blog to expose you to some of my happy discoveries which I really treasure. Paul Mac is just a musical genius in my opinion. He has a wonderful ear as well as poetic style which I fell in love with when I heard “Just The Thing” from his album 3000 Feet High. I loved it so much, I bought the album. As I listened to it, I loved every song which he had written. It really spoke to me. His next album, Panic Room, was really great too. The first song released was Sunshine Eyes which reminded me of Adam except it wasn’t Adam’s eyes I thought about it was Adam’s smile. Again, every song on that album was just terrific. He has worked on many projects which I think are enhanced because of his ear. There is something very special about Paul Mac. I love the way he selects different singers for different songs. It’s just magical. I just discovered soundcloud and am thinking of maybe doing an audio blog with it. The idea is definitely appealing. Missy Higgins does a collaboration with Paul Mac that he has posted there from a movie of a classic song by a band called Sherbet. The song is Howzat! It was a really different take which I liked. I liked the original but the version they did was pretty cool. I have added the two songs below so you can have a listen! Paul Mac, if you ever want a back up singer or lyrist please look me up! HEE HEE! A girl can dream! There are so many things that I love but the thing I love most is my hubby which of course is why I married him. Adam has introduced me to many fine things but the one thing I have to thank him for the most is my love of Smooth Jazz. I love music of most variety but when I hear Smooth Jazz, I automatically think about Adam because he is the one who really helped me listen to it and appreciate it due to his enthusiasm for it. When he came over to the states after challenging me to challenge him back in April of 2001, he had brought his mp3s over so that I could hear what he enjoyed listening to. I kept most of those songs for the exception of two. It wasn’t through his mp3s that I learned about Smooth Jazz. We would listen to radio stations online as well. We found Smooth Jazz.com because he was telling me about his love of Smooth Jazz. Leesville didn’t have any stations with that sort of genre so we of course had to look online. I have heard Jazz before but it was more like New Orleans Jazz the brassy bluesy stuff but the jazz Adam was talking about was not like the stuff I was used to. It was softer. It was really an eye opener for me. After Adam returned to Australia, I found myself listening to it more than I ever did before and this one song really made me think of Adam. It still does to this day. Adam loves instrumentals the most and this song I think just fits him to a tea. It could also do with the fact that I would have visions of him at night as a child being my dance partner too. I will leave the conclusions up to you. Incognito, man the list just goes on and on! There is just so much variety I can barely scratch the surface. I am going to leave you with Get Into My Groove by Incognito! I have this one my mp3s but not the live version. I just love her voice! It’s amazing the things you can discover if you just open up your mind or broaden your horizons. Great things can happen especially through the power of music!